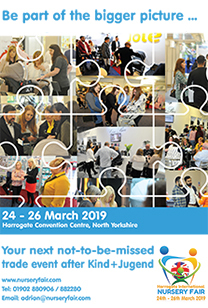 Toys appear to be high on the agenda at Harrogate International Nursery Fair next year, as once again the show has an influx of new companies with delightful play ranges signing up for the 2015 show. Regular brands such as Halilit, East Coast, 2012, 1TwoKids, Hippychick and Cloudb (to name but a few!) are all returning with some fantastic pre-school ranges and will be joined by new exhibitors including Galt, Rainbow Designs and many more which are in the process of finalising stand requirements. 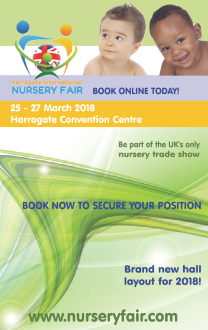 With just four months until the doors to Harrogate International Nursery Fair open from 29th to 31st March 2015, stand space is filling fast, so companies planning to attend, but haven’t yet confirmed their space are advised to complete the online booking form as soon as possible at www.nurseryfair.com – the earlier booked, the better the position.